I remember when my oldest daughter started Kindergarten. It was the first time we ever had to be on a regular schedule in the mornings, and honestly, it threw me for a loop. I turned into a real grouch trying to get a grip on the morning rush. I started to become a yeller. “Where are your shoes! ?” “Turn off cartoons and eat!” “We’re Late! Let’s go, let’s go, let’s go!” After a few days of this, my husband pulled me aside and asked me to stop with the yelling every morning. Not only was it irritating to the whole family, but I was stressing out our daughter every day before we left. “You don’t want to send her off to school stressed out or in a bad mood every day, do you?” Well, of course not! If she isn’t in her best mindset when I send her to school, she won’t perform her best in her studies. We sat down and came up with a game plan on how to get mornings started on the right foot. Just by taking a few extra minutes to plan things out ahead of time made all the difference. Simple things like laying out clothes the night before, keeping bins by the door that we need to grab on the way out, and making sure we had plenty of breakfast options on hand so we didn’t have to fight though “There’s nothing to eat!” every morning. Happy mornings start with breakfast. It is definitely the most important meal of the day. It fuels our bodies, preparing us to face the day with energy. It is also a great time to connect with your family before you all go about your own day. I know there are many families who start their days rushed like we used to, but having your family take just 7 minutes in the morning to connect over breakfast can actually bring families closer together! 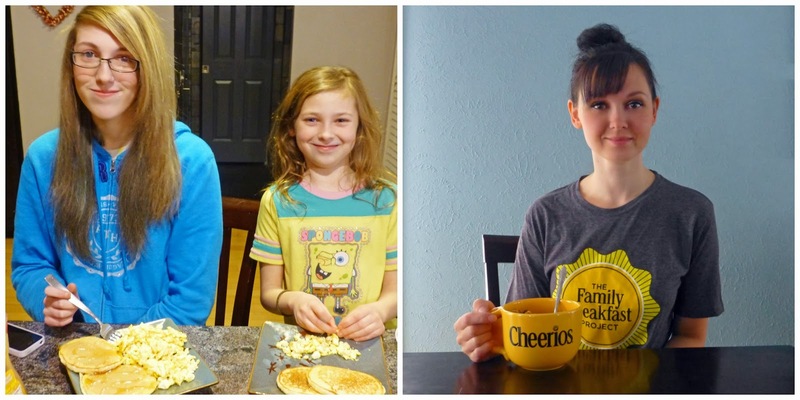 Cheerios is asking families to participate in the Family Breakfast Project. As part of the Family Breakfast Project, Cheerios will be encouraging families to take seven minutes for seven days to have family breakfast and explore the possibilities that it brings. -Prep the pantry. Organize shelves where kids can reach items. Place cereal bowls and utensils within their reach. -Create Breakfast Drawers. Keep breakfast items grouped together, such as Cheerios or any cereal of your choice, peanut butter, raisins and granola bars. In the fridge, yogurt, fruit cups, cheese sticks and apple slices. This will encourage children to make their own breakfast, or even some for their siblings! - At the breakfast table, have conversation starters ready. Have the family tell what they are most looking forward to that day, and what they are most worried about. At dinner, keep the conversations going by having everyone share how those hopes and fears panned out. - Create a Simple Acts of Kindness Jar. Fill a jar with random acts of kindness. Have each family member draw one, then challenge them to follow through with it that day. At dinner, have everyone report how it went. You can find a printable Random Acts of Kindness Sheet right on the Family Breakfast Project page to get you started. - Get kids creative in the kitchen. As hard as we try, some mornings are still rushed. Since I insist on every member having breakfast each morning, having the family pitch in to make simple, on the go cereal bars is a great idea. This is a recipe that my family loves. It’s quick and easy to make, and the family can eat it on the run. In a heavy pan, butter over low heat. Add marshmallows, stirring frequently until melted and combined with the butter. Remove from heat. Stir in cereal and dried cranberries. Allow to cool for several minutes, then add mini chocolate chips. Stir to incorporate into the mixture. Spread mixture onto a rimmed baking sheet (10 x 15) lined with wax paper coated with cook spray. Using a spatula or hands coated with cook spray, gently pack mixture down. Let set at room temperature for 2 hours. Once set, cut into desired breakfast bar sizes and store in an airtight container. There are many more family bonding morning activity suggestions available in the downloadable packet, so be sure to browse through and take the Cheerios Family Breakfast Project this week! *What are some things your family does to bond each morning? Disclosure: The information has been provided by General Mills through Platefull Co-Op in promotion of the Family Breakfast Program. I received a promotional item to help facilitate this post. No monetary compensation was provided. All opinions are my own and have not been influenced by promotional items. NO WAY - those sound awesome. I am going to have to try those. I am a BIG cranberry fan! Those look so delicious. What a great way to start your morning! Since the kiddos aren't cranberry fans I'd substitute raisins.... But this looks like a great recipe! Those bars look so delicious! We are a big fan of Cheerios! We love Cherrios, so I bet we would like these bars. It's really great when you have the whole family for meal time. Even more great with yummy food! Happy Mornings do start with breakfast. I love when we all sit down together for breakfast although that only happens on weekends. Cheerios has always been a part of that as well. My toddler loves it. That sounds absolutely delish! I will have to make these for breakfast on the go! I don't really eat cheerios for some reason.. but that looks yummy something that my niece would definitely love. My whole family would love those! I can totally relate to the morning thing (from today!!!). I was behind and rushing my son. I could tell my telling him sharply that he should have already put his coloring book away hurt his feelings, and I apologized for being a grump! OY!! I hate those moments. But they happen. :) Smooth move on laying things out early, we do that in large part too. It does help a lot! That is a cool idea! I like that it has chocolate too! wow- those sound awesome. I am going to have to try those. I am a BIG cranberry fan! Having breakfast together is a great way to start the day! I love your snack bars; they look incredibly delish! This sounds and looks delicious... I love the photos too... Healthy foods should always look this good. Wow! What delicious breakfast bars you made. My kids love to eat cheerios and we haven't done something cool like this. I wake them up with a back rub. I used to make breakfast. Now we do it all together. We eat together to. These are some very helpful tips. We often have to plan ahead cause it is easy for something to throw off our routine. So its a must that we have one. I think this looks like a nice snack to add to the kid's lunch box too! I'm not in the crazy position of getting the kids ready for school, but just thinking about it makes me feel a little crazy! 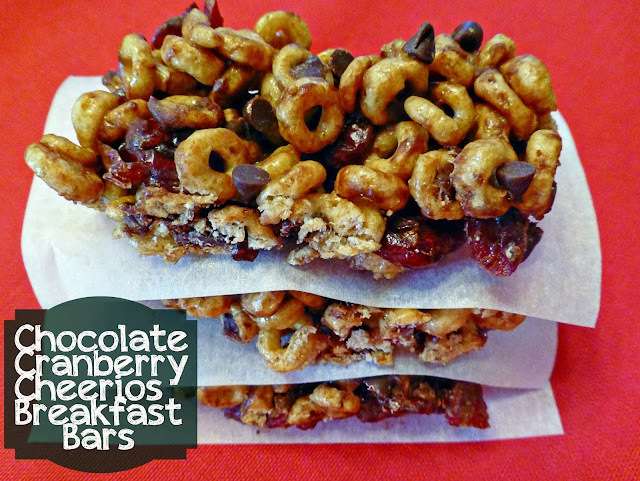 I love the idea of cheerio breakfast bars! Yum!